In September I had a two week run at the Canberra Contemporary Art Space in Manuka, showing work that had developed from my residency in Tokyo two years ago. In between visitors (good numbers of people walking in from the street), I managed several sketches from behind the desk. The view from the desk, including the gallery on the right and the view out the door on the left. A more detailed view of what I could see out the doors of the gallery. The spring blossom across the road attracted many passing photographs. I was reminded earlier today that the phrase is ‘meditation practice’ not ‘meditation perfect’*, so I’m nicking that idea to apply to my art. I don’t know many artists who think their work is ‘perfect’, but sometimes I seem to operate as if that should be the default. So in the spirit of it being Friday I’m cutting myself some slack and having fun with my art ‘practice’. … when this bloke stuck himself right in front of my subjects. What gets in the way of art, becomes the art! The pen I was using wasn’t running smoothly as the cap is a bit loose and the ink dries and causes blockages. I sort-of revived it a bit by putting water from my brush pen onto it, so while the sketch is a bit pale, I think it’s way more interesting than my first effort. The next day the pen wasn’t much better, but I couldn’t resist sketching this cheeky magpie, hanging around the cafe for a feed. The first parts of the sketch were pale and then with help from my partner we managed to get the ink flowing a bit better . Once that was done I realised that I had made a much more interesting range of marks than if the ink had been flowing properly. I picked up that pen again today, but not before actually checking and re-filling it. This morning I didn’t find my fellow cafe-goers very exciting subjects, so I decided to include some of the graphics from the nearby reptile shop to make things more interesting. I decided the whole could be improved if I added some paint when I got home. I then decided, in short order, that the result wasn’t quite what I was after. So I resorted to even more paint. I’m feeling much happier about this version. Sadly I have to report that since the big make-over of the small precinct where we go for coffee, that our dinosaur has ‘left the building’. It has been replaced by two trees some ground-cover plants and a lot of wood-chips. Making my sketches ‘interesting’ will become more of a challenge with the dinosaur. We took a quick trip up the road today to Goulburn, one of the oldest cities in New South Wales. As always we were attracted by the various period buildings throughout the city. This visit we allowed enough time to make a number of sketches. While waiting for my lunch I quickly sketched one of the commercial premises on the main street. I found the combination of dark and light patterns a perfect subject for playing with my fountain pen. After lunch we shifted down to the railway lines to paint, not the attractively restored station, but rather one of the storage buildings further along the track. Our final stop was back in Belmore Park, in the centre of the city where we decided to make a quick sketch of the Victorian era Court House. I swapped styles yet again to try out my black and white and a punch of colour technique. I was pretty pleased with the outcome except for one thing – I left out a whole section of the upper level of the building – oops. There was nothing for it but to have another go. One of the things I realised when I looked even more closely is that the top of the dome is quite literally crowned with a copy of Queen Victoria’s imperial and state crown that featured in the print of the Queen, a copy of which graced my grandparent’s home. Our day of sketching ended somewhat abruptly when a bus load of school boys arrived and quite literally parked out the view and raised the decibel level in the park quite dramatically. For these sketches I got to try out my Stillman and Birn Gamma series Vellum Suface sketchbook, (150gsm). It has been a long time between drinks, of coffee that is. In reality it’s been a while since I got my pencils out while sitting down with a cup of coffee. Last Saturday’s offerings are as follows. Sadly just as I was getting stuck into capturing this striking older woman, there was a glitch in our coffee order. By the time it was sorted out she’d left. Thankfully this man was in for the duration (of my attention at least). It has been a thoroughly miserable day here weatherwise. 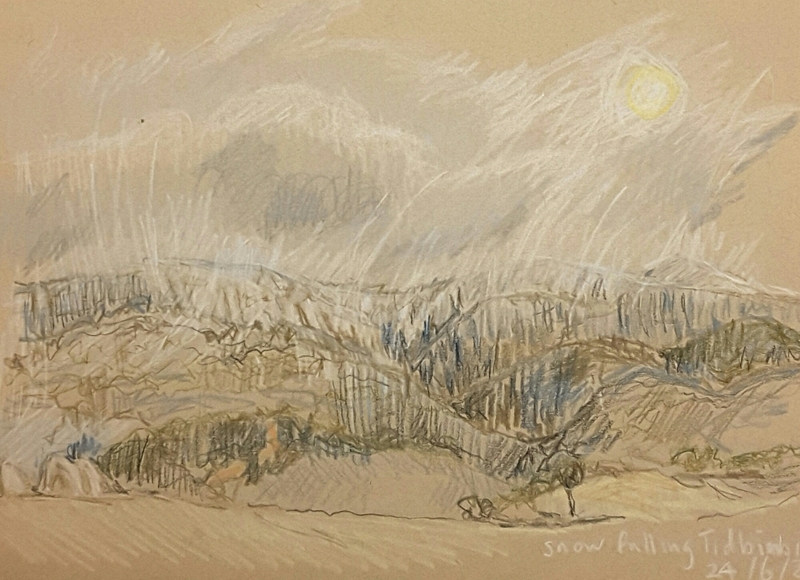 My partner suggested that we get out to have a closer look at the snow falling on the nearby ranges. We drove out to Tidbinbilla Nature Reserve, from where we could see the snow clouds sweeping across the tops of the range. Where we were, on the valley floor, a flock of swallows swooped around our car. I could hardly believe how beautiful it all was. I’m saying that because my drawing was done completely from inside the warmth of our car! 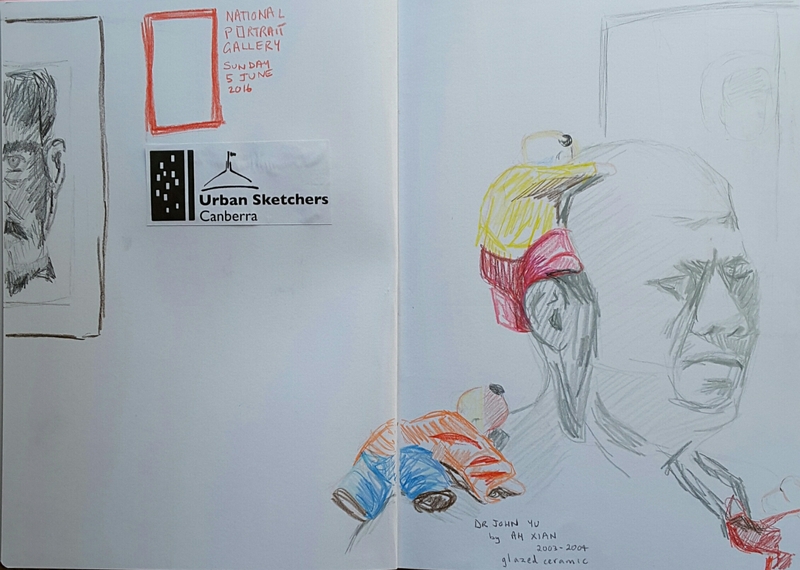 The weather was truly awful yesterday, but nineteen brave souls made it to the June sketchmeet of Urban Sketchers Canberra at the National Portrait Gallery. We also had four new people make it for first time, which was just fantastic on such a rainy day. After brief introductions and such we split up to sketch the gallery. My first stop was to sketch the ceramic sculpture of Dr John Yu, by the artist Ah Xian. As is appropriate for a retired paediatrician, Dr Yu’s bust includes small children scrabling over it. The bust itself is made with a celedon glaze, which is apparently a favourite of the sitter. It was very pleasant to be inside the gallery looking out onto the rainy weather. 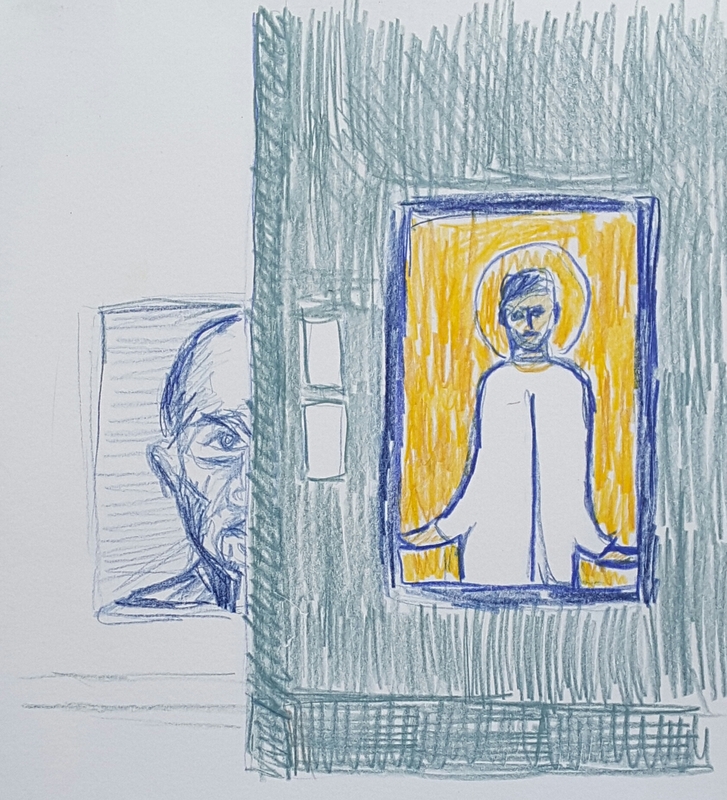 My second sketch was of such a view down one of the cross corridors of the gallery. 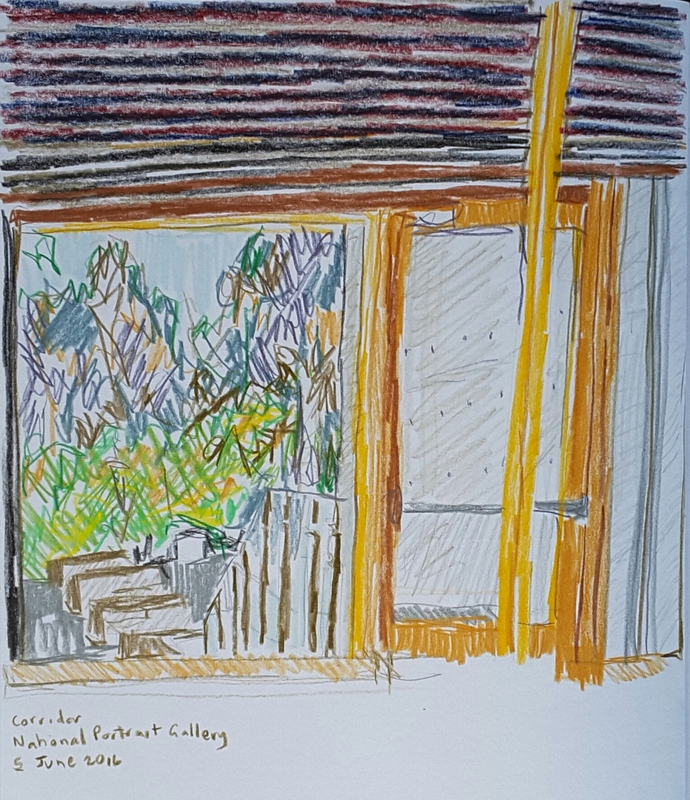 I was walking back to join the group for our sketchbook throw down when I decided I had just enough time to draw one of the interesting double views that gallery architecture facilitates. As always our group welcomes new members and visitors to join us. Our next sketchmeet will be on Sunday 3 July, 10.15 am at (New) Parliament House. It only took one look to decide what the subject of this week’s drawing would be. Strong light was delineating the rather dashing hat being worn by a man at a nearby table. The light also cast a dramatic diagonal across his face.